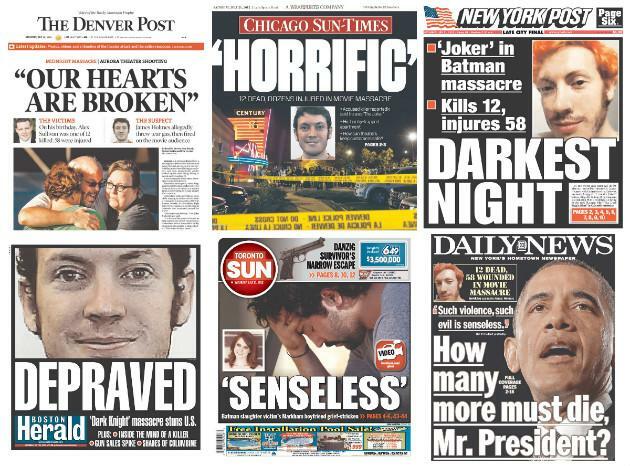 The deadly shooting that killed 12 people and wounded 58 others at an Aurora, Colo., movie theater was featured on the covers of most of the world's newspapers on Saturday. While many focused on the scene of shooting, its aftermath and the grief-stricken residents of the Denver suburb, others featured James Holmes, the suspected shooter in Friday's massacre. "OUR HEARTS ARE BROKEN," the Denver Post's headline said. "MIDNIGHT MASSACRE," the Los Angeles Times wrote. "DEPRAVED," the Boston Herald wrote. "HORRIFIC," the Chicago Sun-Times said. "DARKEST NIGHT," the New York Post declared. The New York Daily News used its cover to pivot to the gun control debate. "How many more must die, Mr. President?" the Daily News headline hovered over a photo of President Obama, with the mass shootings in Columbine, Va. Tech and Binghamton listed in ticker form. In Toronto, hockey blogger Jessica Ghawi--a victim who had witnessed last month's mass shooting incident in a Toronto mall--was the focus of several covers. The Toronto Sun put a photo of Ghawi's boyfriend, who lives in nearby Markham, Ontario, on its cover under the headline, "Senseless." The National Post's cover story--"The Wisdom of Jessica Ghawi"--included some of her writing. Surprisingly, not every newspaper in Colorado featured the shooting on the front page. In Steamboat Springs, the Aurora massacre was on page five of Saturday's Steamboat Today.